How well do you sleep? Do you find yourself waking up feeling tired and grumpy and suffering from brain fog? Do you have trouble falling off to sleep due to stress, ill health or the weather? Well if the answer to any of those is yes, then believe me I feel your pain. I was always one of those people that could survive on a few hours sleep when I was younger, I would party hard, crawl in at 3am and be at work at my desk by 6am. Yep, believe me, I did it for years and years and got away with it. Then I had children and boy oh boy, broken sleep just crushed me. It was a whole other level of sleep deprivation! I just could not fall asleep easily as I was listening out for the baby, then I would be unsettled and before you know it I would be up feeding again. Add to that a second child that did not sleep through the night until he was five (only four short years ago) and basically I was done! This has been the way I have remained for the past eighteen years now. I find it so hard to fall asleep and go through stages of complete insomnia. I need all the help I can get when it comes to relaxing and sleeping, I just don’t switch off easily. 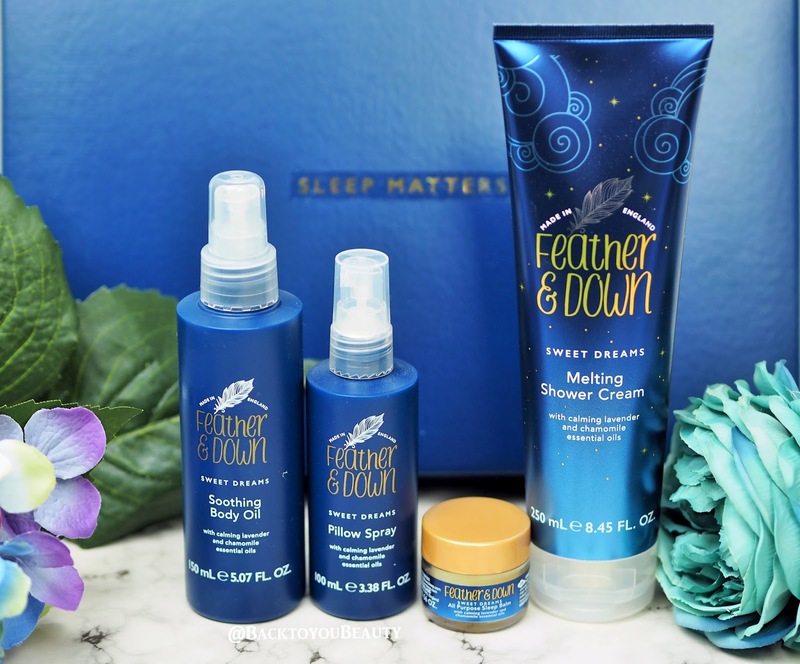 That is why I was absolutely thrilled to put Sleep products from Feather & Down to the test. Made in England, Feather & Down have a range of Bath, Body and Home fragrance products that aim to help you relax and find a calming sleep routine that works. If they work on me, believe me, they will work on anyone. I was sent a lovely selection of four products that are all easily available in Boots and are such incredible value with each product being under £10. Having only launched in May, I was super excited about this new brand. Blended with Lavender and Chamomile essential oils these products help ease the mind, unwind and encourage a state of deep relaxation. Oh wow, now whether you prefer a relaxing bath or refreshing shower before bed, make sure you take this in with you. This is absolutely divine and at only £6 per tube it is giving my high end version (which retails at £25!!) a serious run for it’s money. When applied to wet skin in the bath or shower, this creamy, dreamy shower cream immediately lets off a hit of calming Lavender and Chamomile essential oils. Straight away I can feel my tension start to leave my shoulders and everything just relax. When applied to a shower sponge, you get beautifully soft and gentle bubbles that thoroughly cleanse and moisturise the skin leaving it delicately scented. This is without a doubt one of the best shower creams I have used in a long time and a definite dupe for a high end shower product! Blown away by how relaxing and sophisticated this product is and as it is such a reasonable price for such a huge tube, I really don’t mind sharing it with the family! An absolute must have! After your bath or shower, why not continue with the experience and apply this Soothing Body Oil to damp skin. In a spray container, this is easy to use without becoming a sticky mess. Infused with Lavender and Chamomile essential oils, as well as Sweet Almond, Jojoba and Moringa Oils this is beautiful at applying to the skin to hydrate it, keep it looking smooth and shiny and relax the body. If you are lucky enough to have someone that can give you a massage, then fill your boots. My nine year old loves this massaged into his neck and shoulders after his tennis lesson as he finds it hard to unwind and I just love to smoother it everywhere. 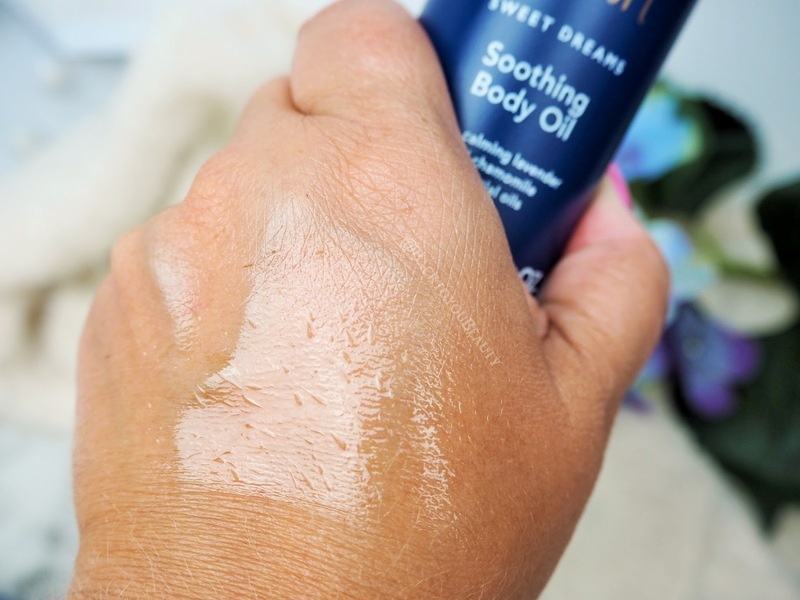 A lovely, almost dry oil that doesn’t leave you sticking to your pyjamas or bed sheets. Slightly stronger in scent than the shower cream but a lovely product to layer, and help you on your way to a blissful nights sleep. 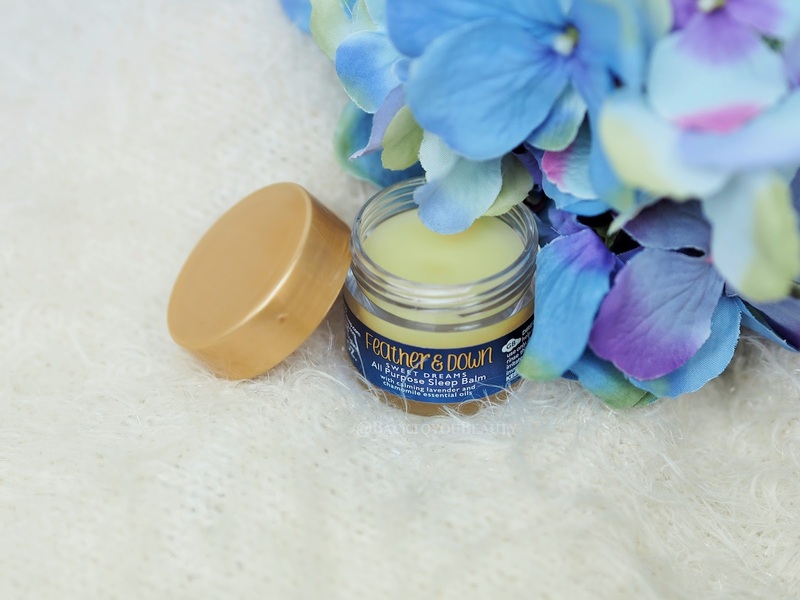 This little pot of balm is a blend of moisturising Vitamin E and Essentials oils and is to be applied to your pulse points. It is very delicately scented and a very handy size, especially if you are travelling. I like this more as an aid to relax than to sleep, so when I find myself feeling a bit frazzled I apply this to my pulse points and breath in the calming aromas and take a moment to just breathe….. Lovely when used in your wind down routine of an evening, as you can apply this an hour or so before bedtime, as part of a signal to your body that it is time to start switching off from the stress of the day. Also a great product to leave by the side of the bed, so if you do wake up in the night you can apply it where needed and hopefully drift off again. Did you know that Lavender increases the type of brain waves used in the association with sleep? Well Feather & Down do and by now you may have noticed how they use it in all their sleep products. It is such a calming and relaxing scent and one that I have always associated with unwinding. The pillow spray is, again, such incredible value at just £7.00, as I have seen other brands create similar products at a much higher price point. For me, this is the product that has the strongest scent of lavender, as though you have brushed past a huge Lavender bush. I find it a little too strong so I have to spray my pillow at least 30 minutes before I am ready to lay on it, to let it settle a bit and waft around the room. However, I must admit, on the nights I do use this, I am literally out like a light which is incredible. 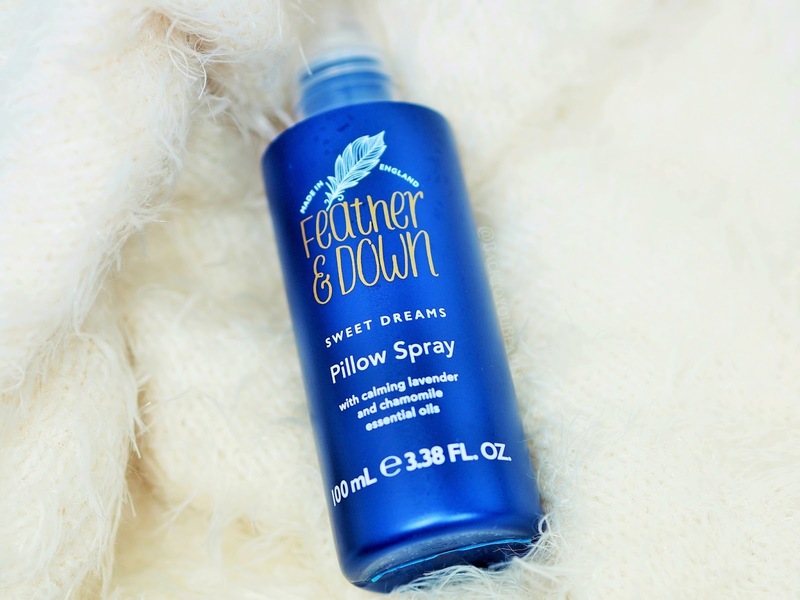 My thoughts on this brand – Firstly, Feather & Down cannot guarantee you a nights sleep, you may have underlying issues that may need to be checked out by your G.P. However, what they can do is form part of a sleep routine that lets your body know it is time to unwind and start settling down to sleep. I am absolutely blown away by how incredible these products are and again, the price is just amazing. My favourite products are without a shadow of a doubt the Shower Cream and the body oil. They work so beautifully together and really calm and relax me and help me drift off to sleep quicker. As a bath obsessive I am so looking forward to trying their bath products and very excited to try their candles and home range, so will most definitely keep you posted. If you know someone that struggles with relaxing and falling asleep, or you yourself struggle, especially in this incredibly hot weather we have been having, pop down to Boots and take a look at this range. I am sure you will love it as much as me. Have you tried this range before? Leave me a comment below as I would love to hear your thoughts. "Studio 10 – Ageless Beauty for mature skin"
Ooh those products sound right up my street! I love lavender particularly! I've had my eyes on this brand in Instagram for a while. Their products sound heavenly and I think I'll treat myself to some next payday. Everyone is raving about these products! I think I need to invest!